Example 43 W. Washington St. The Indian word, bungalow, was first used by the British during their 19th century rule in India to decribe a one story low hip-roofed house encircled by a wide veranda or porch. The early 20th century saw the development of the Arts & Crafts movement led by Gustave Stickley in California. Stickley followed the movement in England which came as a reaction to the success of a machine-made environment; furniture & architecture. He sought a return to individual craftsmanship. The furniture he designed became known as the Mission Style. 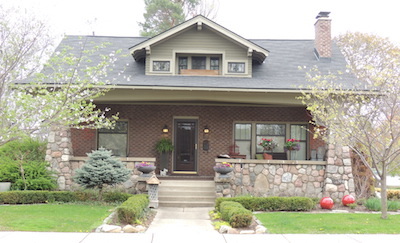 The homes he designed, as seen in Craftsman Homes, pub. 1909, used simple plans, natural materials, and the single story veranda-encircled bungalow as a starting point. All in an attempt to blend with the natural setting. As the style developed local interpretation added elements from other syles & cultures, most notably those from Spanish &Japanese architecture. Derivatives of the style were built all across the country in a variety of materials, brick, stone, wood & concrete block; and combinations of these materials. Whole neighborhoods of these derivatives were built in the U.S. in the 1920s. Sears Roebuck marketed mailorder bungalows shipping numbered materials ready for assembly to builders, while many local building companies had their own catalog of affordable house styles.